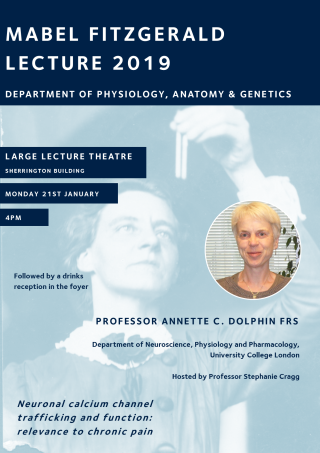 The Mabel FitzGerald Lecture 2019, in honour of the pioneering physiologist and clinical pathologist renowned for her work on the physiology of respiration, is to take place on Monday 21 January at 4pm in the Large Lecture Theatre, Sherrington Building. The talk, entitled Neuronal calcium channel trafficking and function: relevance to chronic pain, is due to be given by Professor Annette C. Dolphin FRS, Professor of Pharmacology in the Department of Neuroscience, Physiology and Pharmacology at University College London. Annette Dolphin received her BA in Natural Sciences (Biochemistry) from the University of Oxford and her PhD from University of London, Institute of Psychiatry. She then held postdoctoral fellowships at the College de France in Paris, and at Yale University, before returning to UK to the National Institute for Medical Research; followed by a lectureship in the Pharmacology Department of St. George’s Hospital Medical School, London University. She was appointed Chair of the Department of Pharmacology at Royal Free Hospital School of Medicine, London University in 1990, and moved to University College London in 1997. She was elected to the Academy of Medical Sciences in 1999, the Royal Society in 2015 and Academia Europea in 2018. She is a Wellcome Trust Senior Investigator, and held a Royal Society Leverhulme Trust Senior Research fellowship (2016-17). Annette is an ion channel physiologist, with a particular interest in studying voltage-gated calcium channel function. She has many years’ experience running a research lab in academia; for the last 20 years, at University College London. She is particularly interested in the physiology and pharmacology of neuronal calcium channels, and in diseases involving these channels. Her research utilises electrophysiology, as well as biochemical and imaging techniques. Her most recent work relates particularly to the role of neuronal calcium channels in peripheral pain pathways. The event this year will not only involve a lecture from Professor Dolphin, but also a drinks and canapes reception in the foyer. All members of the University are welcome!